A day job takes a lot out of us. Returning home at around 7 pm and then going back to office, the next morning is a bit of a monotonous routine which almost everyone of us do not appreciate. Even our families wait for weekends to enjoy with us and also get the chores done. When we reach home, we usually spend our time watching news or some form of entertainment on television. We spend time on our mobile phones, watching YouTube videos, scrolling facebook and instagram pages and so on. But is that enough? Are we taking care of the larger goals in life? Health. This gives us the energy and ensures longevity. Personal. There are some aspirations that everyone has, but does not address due to lack of time. Family. These are the people who are with us throughout our lifetime, good or bad, happy or sad. Net Worth. This is the financial aspiration for bread and butter. You need to address all of them in order to lead a happy and successful life. Ignoring any one of them has its negative effects on our lives, either short term or long term. Therefore, as you return home from work, there is something useful and productive that you can do to address these important areas of life in about four or five hours that you have. Write down at least 2 things in each of these areas that you need to address and find the most important one. Plan your goals and take it One Bite at a Time. It may be going for a quick jog in the park or gym, finish 4 books in a month, teaching your kids or even playing with them or so on. But keep a larger goal in your mind. Once you are home, do not get involved in activities which eat up your time and do not contribute to any of these four areas. These activities are typically watching youtube videos, engaging in social media, talking to colleagues over the phone, watching television for more than an hour, etc. These activities are the activities that do not require your attention once you are at home with your family. You may also install controlling apps such as QualityTime or RescueTime to limit your smartphone usage. Uncontrolled smartphone usage is a curse to productivity and happiness. Remember that the amount of facetime that you give to any of your relation, has a direct impact on the strength and depth of the relationship. Make sure when you talk to people, keep your phones away, look at them, smile and talk. Listen to your spouse’s or kids’ routine, what has happened to them at their school, college or jobs. You may sometimes plan your weekends on Thursdays or Fridays which gives everyone something to look forward to on the coming weekend. It may be a movie, a visit to a mall, a small pizza party at home or any such thing. Engage and enjoy with them. Spend about an hour dedicated to yourself. During this hour, read books, listen to songs or do any activity that pleases you, for which you do not have time but you would love to do! It may also be working towards an idea that you may have had but never got time to work towards it. Even a small step everyday will take you about 300 steps in a year. If you do not take small steps, time is going to pass anyway! It may even be building a skill that may be required for your professional growth at job by doing an online course or something else, but you never got time to look at it. Think and write down the top three things that you will do tomorrow. Spend this time in isolation to be most effective. The last thing you do before dozing off to sleep is setting up an alarm for the morning. Seven to eight hours of sleep is healthy for an adult. It feels really nice to dim your lights at least 15-20 minutes before you sleep. It tranquilizes you and sets up the mood for a good sleep. Performing the above activities after you return home makes you productive and gives you a feeling of success. Everyone has the same time when they return home, but some people make better use of it than others, only to be more happy and energetic. It is not necessary to do the same things every day again and again. But try this with a perspective in mind for a month to translate it into a habit! If you have more such tips and hacks, please share in the comments below! I’d love to hear them. If you like what you just read, please hit the Like & Share Button so that others may stumble upon this. Follow this blog for more useful articles! One Bite at a Time! How do you eat a big cake? The answer is simple, One Bite at a Time! The most simple way to achieve any big goal or target is to start with a step towards it, a step at a time. The very first prerequisite for this to happen is that you must have goals. To understand this, let’s bring out some astonishing facts. Fact 1: According to a Harvard study, only 3% people have clear and written goals, 13 % have goals but not in writing. And most of the remaining people work for the goals of the 3% people. It was found that 3% of people who had written goals, earned, on average, 10 times as much as the remaining 97% all together. All successful millionaires and billionaires have written goals. Fact 2: Most people talk about problems, who is to blame and what they don’t want, most of the time. Fact 3: All goals are attainable. There is a natural cybernetic mechanism inside our mind which helps us achieve goals. Nature doesn’t discriminate goals based on their size. If you set large goals, you’ll achieve them. So, then why is it that most people do not have clear, measurable & written goals? Reason 1: Writing down goals is not important, even if you have one. Look around to ask people who have written goals! Reason 2: Not aware on how to write my goals. Have you ever received even an hour of instruction to write goals? Reason 3: Fear of failure. Have you ever thought of a big goal and then thought it is unachievable? Reason 4: Social pressure and rejection. Have you ever thought that will my friends or family criticize or ridicule for my failure? Things won’t get better by themselves. If we want a change, we need to have clear written goals. Clarity serves a critical purpose in goal-setting and has a direct relation to goal attainability. Not having clear goals is similar to a living in city with no road signs. Now, how do you write your goals and set to achieve them? You may use this to help you set implementable goals and follow these steps! Time is going to pass anyway. Whether you set your goals or not, whether you achieve them or not, whether you perform this exercise or not! Therefore, I recommend you to go through this exercise for a simple goal to test the waters. Imagine you have no limitations and you have all the money and time in the world, all the education and experience. What would you do? Make your goal measurable and specific. Write you goal in a simple present, as if you already do it. For instance, we may take a simple goal to double your earnings “I earn Rs. 50,000 a month”. It is in present, specific and measurable. Just add a “by” sentence to your goal statement such as “I earn Rs. 50,000 a month by April 2018”. If you goal is big and long term, set sub-deadlines. In the above example, you may set quarterly deadlines. Write down all the things that will make it difficult for you to achieve your goal. These things may be lack of time, money, etc. It is said that 80% of the constraints lie within you and only 20% are outside of you. Write down all the knowledge and skills required to achieve your goal. These may be certifications, degrees, etc required for you in order to achieve your goal. Write down all the people with name or roles who you think will play a key part for your goal attainment. This will help you maintain a useful network and a clarity of what you need from them. Try to answer the question by putting a ‘how‘ on your goal. For example, ask yourself, “How will I earn Rs. 50,000 a month by April 2018”. Attempt to write at least 20 answers to this question. The more answers you write, the more you stretch your mind and the more probability of you achieving it. Write every single task required to achieve this goal. Now, against all the tasks listed down in step 6, write a date in front of it, keeping in mind the sequence of events and your final goal attainment date. If you are unable to allocate a date, at least write a month. Plan the night before, what you need to do tomorrow to achieve this goal. Plan for a week and month ahead of time. For example, review tasks to be completed for next week every Friday or Monday. On last day of the month, write down the tasks to be done in the coming month. Step 9: Just do it! The most important thing is the action you take to achieve your tasks in order to achieve the bigger goal. Do not stress out planning too hard, keep it simple and you will be astonished to see the results. Remember that the act of breaking down your goal into tasks with deadlines and writing it out, almost makes it certain for you to achieve the goal. Do not discuss about your goal with anyone initially to overcome the reasons listed above. You can definitely eat the whole cake, but one bite at a time. The Choice Hour – Get off the “Someday Isle”! If you are resonating with one of those thoughts or phrases, I strongly recommend you to read on. And importantly, get started! What is this “Someday Isle”? The very first thing is to understand the “someday isle”. Where is this “someday isle”? This island is all around us, probably we are on it and spending most of our time on it. What do people do on it? They think, dream & fantasize about things they are going to do someday! Who are they surrounded with? They are surrounded with people who are spending a vacation on this island. What is the main topic of discussion? People discuss excuses to each other of not doing what they wanted to do! “I didn’t find time”, “It is not the right time to start”, “My situation is much more different & difficult than his”, etc. They ask each other, why are you here? And not surprisingly, their answers are largely the same. Probably 80% of the population lives on the ‘someday isle’ . It is surprising that we all know what needs to be done in order to achieve what we want. However, a vacation on this special island prevents us to start with it. It is said that if people make as much effort to work towards their goal or idea as much they do to make excuses, they will surprise themselves. The first thing you can do is to push yourself off the island. How to push yourself off the island? Let’s do a back calculation for the time everyone has! Remember this is the same time which a successful person has as you have. There are 24 hrs, take out 9 hours of your job. Subtract another 2 for your travel, 7 hours for sleep. For the remaining 6 hours, give about 2 hours to your family commitments and you have 4 hours on the table. Out of these 4 hours, think for a minute and ask yourself, is it possible for you to spend an hour a day on something that you always wanted to achieve? It may be writing a book, working on a tech idea, a startup thought, losing weight, finding your dream job, etc. This one hour is your hour – The Choice Hour! Make the most of it! If you need a change, you have to do something different! You need to push yourself off the “someday isle”. Write down that one thing! Make a plan, break it down and work towards that plan each day during the choice hour! At the end of each day, ask yourself, what progress have I made towards my idea or goal? If you do this for a month, without fail, you will surprise yourself! Do give it a try, and then help others. Stay motivated. Put the band-aid, but fix the nail! When you scratch yourself against a protruding nail, put the bandage on your hand immediately. But do not stop here! Fix the nail and hammer it in. The analogy here draws our attention to solving business problems, or any problem as a matter of fact! To fix anything that is hurting your business, take an immediate action but think long term. What most businesses and startups do is to stop after the immediate fix! That reproduces the same problem at a later time, only to spend more time & resources to fix the same thing. Once you apply the immediate fix, invest some more time to fix it once and for all. So if your product sales is not achieving its target, put an immediate fix. You may employ a few more sales executives, get market research data or buy lead data, etc to achieve your target but do not stop here and think long term. Sit down with your team to brainstorm. But this surely, isn’t an easy task to do! So, here’s a quick guide! What is a problem and why does it occur? A business may not be achieving what the industry or the market is expecting it to achieve as a standard. It may be 100% on-time delivery, 95% QA, etc. A business may be achieving 100% on-time delivery where on-time is a lead time of 2 weeks, it may now look to offer a 1 week lead time with same efficiency. A business may be looking to solve an unaddressed problem such as many startups like Paytm, Grofers, Flipkart, etc have done! Solving any of these problems and fixing them for long term has the benefits which makes it worthy of investing time and resources. It develops a common understanding of the problem, business-wide and thus reduces the time lost in discussing about the problem rather than solving it. It ensures that the same problems doesn’t occur again. Also, using the proven and standardized methods of solving problems increases chances of success in lesser time! Companies such as Ford motors with their ‘8 Discipline‘ method, 6 Sigma with the ‘DMAIC‘ approach, Toyota’s Business Practice, PDCA method and many more have researched methods to solve their problems, which all follow a similar pattern but have been fine tuned to their need. It is important to identify people with the right skills and attitude who yo think shall be able to contribute to the problem solving discussion. The team should touch upon all the possible areas that the problem could touch upon as you think at this point of time. For a sales problem, you may call upon people from sales, marketing & product. Preferably, a team of 3-5 people is good for a discussion, do not overcrowd. Address the 5Ws and 2Hs. Who? What? When? Where? Why? How? How many? Who are the people associated with the problem? What is their problem as in first step? When was the problem identified? Where did the problem occur? Why did it occur as reported? How did the problem occur (can you reproduce it)? How many problems occured to define its size and frequency? And while you are breaking & scoping the problem, prepare an A3 report simultaneously which, in brief, is a one pager story of the problem. To identify the root cause, it is important for the team which is solving the problem to reproduce the problem and see. If it is not possible to reproduce, a ground study is required. For instance, as per our sales example, taking customer feedback personally or talking to the sales representative directly will help. Brainstorm all possible causes of the problem and make sure to jot them down either on a whiteboard or a common screen. Usually a whiteboard will help much more as it gives a free hand. A fishbone diagram technique is helpful to direct the brainstorming session. This technique has different categories such as 5Ms, 8Ps and 5Ss depending upon the type of industry. Apply the 5 Why technique, which means that ask a Why on the problem again and again until you don’t have an answer. Here, 5 is just a number to emphasize that many Why’s are required to get to the root cause. Sometimes, even more than 5 Why’s may be required. Once the team has finished the root cause analysis and brainstorming, it is important to develop counter measures in order to suppress the root cause of the problem ensuring that it does not repeat. While developing counter measures, it is also necessary to ensure that these do not arise another problem. This is a time taking step and requires perseverance and the team should not give up in this phase. Put the counter measures to work and monitor the new process regularly for any deviations or difficulties in implementation and tweaking required, if any. Treat this like a beta testing phase. Once you have seen and monitored the process long enough for your satisfaction, evaluate the results of the solution implemented. Document the way the problem occured, circumstances around it and how you solved it. This will help standardize the success. This is where the A3 report suggested above is useful. This eight step guide can be applied to any business problems such as issues in product quality, product returns, human errors in a process, inventory problems, dipping sales, innovating to sustain competition and attain market leadership, increasing employee satisfaction to retain talent and so on! Therefore, act now but think long term! There’s a lot more that can be done with our time and habits to direct our attention to personal success without really disturbing much! In metro and urban cities, we usually spend long hours in traffic driving from between our office and home. An average of 2 hours a day is spent in this activity. Thanks to new startups who have got the new tech books called audio books, it is easy to listen to books rather than using our eyeballs. Get audio books of the books you always wanted to read on your phone or USB drive. Play it in the car. You will be able to listen to at least 2 books a week. Emails are the biggest threat to productivity. With the smartphones, it is the emails that control our attention rather than we, controlling our emails and attention. Make sure that you change the smartphone email settings to ‘manual sync’ and check only at fixed hours in a day, twice or may be thrice a day! This will significantly reduce the notifications and disturbances on our smartphone. Jack Dorsey, CEO of Twitter shared his productivity secret, “The way I found that works for me is I theme my days“. Creating chunks of time to do a task gathers your focus and concentration which results in better performance. So, for example, you can create a chunk from 11 am – 12 noon for working on document, every Friday evening for review of your team, 10 am – 1030 am for making calls, and so on. Whenever you have a lot to do during the day, ask yourself this question, if you are allowed to do only one thing today before you are called out of town, what would be it? Once you pick it, complete that thing and then ask the same question again. It works magic! One of the best ways to manage clutter is decide a place to inbox all the incoming clutter but make sure you review the inbox at a decided time of week or a specific time of day! This helps you let you do what you were doing when any incoming request came that required your attention (which is not urgent). This rule comes from David Allen’s bestselling book, Getting Things Done. It states that if any work requires action, think if it can be done in 2 minutes. If it can be completed in 2 mins, do it now! It’s surprising how many things we put off that we could get done in two minutes or less. You will start completing small activities and not schedule them for future and hence create a much stress free space for yourself! Multi-tasking in only good for software. For humans, single handling increases productivity. It is one of the most powerful time management techniques researched and will increase your output by around 500%. Launch a task, work on it until it is complete! There is a lot of requirement for us to travel short and long distances for work and business. Our time during this flight usually goes without any much productive use. When you are about to travel, think a day before of what you need to do during that time. Download a book, movie, magazine or any other stuff offline to make use of that time. Remember that the amount of facetime you give to any of your relation, has a direct relation to the strength and depth of the relationship. Make sure when you talk to them, keep your phones away, look at them, smile and talk. Be sure to remain positive. Use your social media for this. Follow facebook pages which inspire you, blogs that make you feel empowered and twitter handles that give you motivation. It is a nice way to put social media to good use. Remember – time is currency, so spend it wisely! Cheers. Most people are unable to overcome a negative situation. A negative situation may arise in your personal life such as not being able to get a job or in a relationship. It may also be in your professional life such as not able to get promotions, or up your product sales. These negative situations arise out of the negative emotions and are the single biggest enemy of our life. Therefore, what do we about it? The answer is to eliminate the negative emotions inside us to stay happy. This is the most logical and simple answer for this question. But where do these negative emotions come from? According to a research, almost all the negative emotions depend on blaming someone or something else for the negative situations that happen in your life. This is human-like quality and will happen to each one of us and even happens to successful people too. So then why do some people come out positive from a negative situation? The key is this – People tend to hold on to these negative emotions, even if they can’t do anything about it or change it. This drives them into the loop about thinking about the same problem again and again. But it is this behavior that separates successful people from the crowd. People who drive themselves out of a negative situation hold themselves responsible for all the situations they are involved into. You might say that you cannot be responsible for something that you have not participated in, for example, if your car was parked in the parking lot and someone bumped into your car. 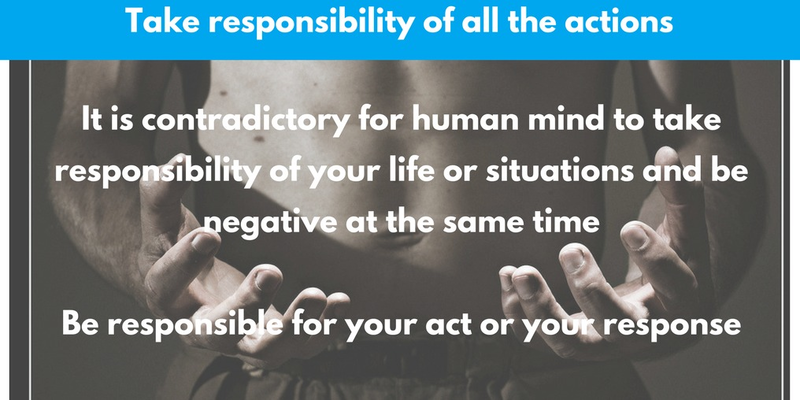 Yes, you are correct, you are not responsible for the action but you are still responsible for the way you respond to it. It is important to note that you can’t take responsibility of your life or situations and be negative at the same time. It is contradictory to the human mind. Take a deep breath, stay calm! It helps to slow down the rush of blood and helps to you to respond and not react. 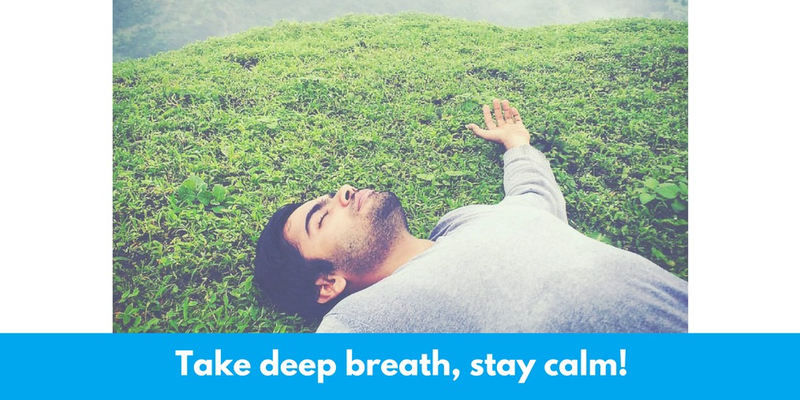 Resolve to stay calm when something negative happens and a deep breath drastically increases the chances of a positive reaction to the situation. It is your mental diet that determines your character, similar to the physical diet that determines your physical health. Therefore, it is important to consume good mentally, in order to deliver positive thoughts and actions. 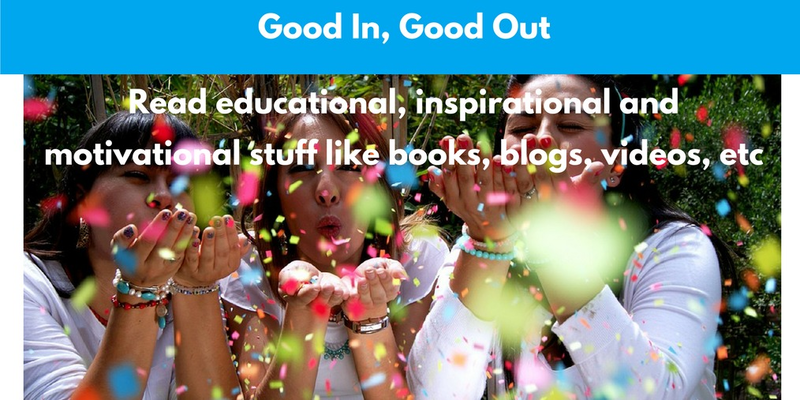 Read educational, inspirational and motivational stuff like books, blogs, videos, etc. When you face a negative situation, a fight, a conflict, a problem, etc, try to shift your mind to think about the possible solutions to resolve the matter. Collect facts about the situation, ask questions and write your problem and everything down (mostly for business problems). This is the second most successful technique to turn a negative situation on its head. 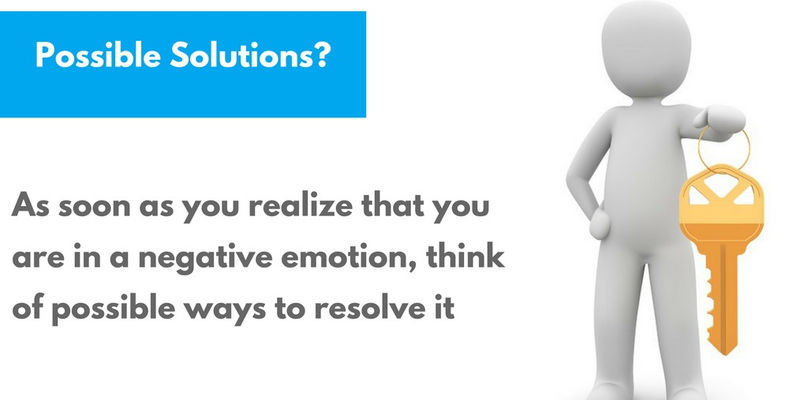 As soon as you realize that you are in a negative emotion, think of possible ways to resolve it. 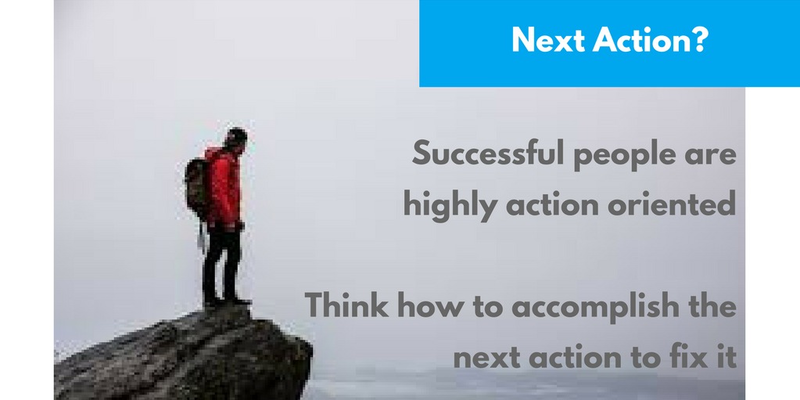 Successful people are highly action oriented. When they face a problem or a negative situation, they find possible solutions and think what can be done next, how to fix this situation. This is the most successful technique of handling a negative emotion. Think about how to accomplish the next action to fix the situation. Handling negative situations and responding maturely to turn them into positive emotions largely determines your personal success and happiness in life. Can we Redefine the Whistleblowers Protection Act on Blockchain?